President Muhammadu Buhari has urged the media not to see themselves as mere critics, but as true partners in the task of nation building. informing the people of the country. stance of our administration,” he said. watershed in the political history of the country. desire of politicians to win elections,” he said. disintegrate after the 2015 general elections. recognition and serve as inspiration to others’’. patriotism, justice and fairness,’’ the President added. Other awardees at the event included Chibok schoolgirls; Speaker of the House of Representatives, Yakubu Dogara, and Governor Ibrahim Dankwambo of Gombe state. 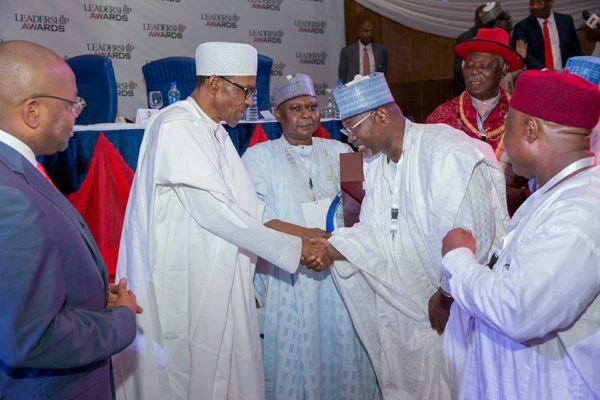 Boboye Oyeyemi, the Corps Marshal, Federal Road Safety Commission (FRSC), received the Leadership Public Officer of the Year 2015 award, while Korede Bello, the singer of the popular song “God Win” emerged Leadership Artiste of the Year 2015.